Private Colorado River Overnight Trip with Canyonlands Field Institute begins at Dewey Bridge and runs through the scenic Fisher Towers section through Professor Valley near Moab UT. Join us with your family or friends! We begin with your group at the historic Dewey Bridge and end the next afternoon at the BLM boat ramp after a day of scenic floating and river fun, sumptuous dinner and camping under the stars, and final day of gentle to exciting whitewater. 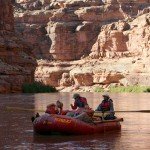 This scenic river stretch is rated Class I-II (out of V to designate level types and quantity of whitewater) and we use a variety of boats depending on the time of year and your interests. This is a perfect stretch for families with a variety of ages, and our naturalist guides are great with kids. Contact us about your desired dates and also inquire about special request add-ons such as guest experts. What months available: This custom, private trip is available from mid- April through October. Cost per Person: Fee is based on a minimum of 6 participants and includes transportation from Moab.